His Honor Newland Pontiff III, late of Exeter Territorial Prison, now presides over a vast tract of land with the ambitious town of Cayuse Falls at its center‚ town he’s confident he can transform into the ‘Washington of the West,’ given enough time. But a demon from his past haunts the horizon, and time is running short. 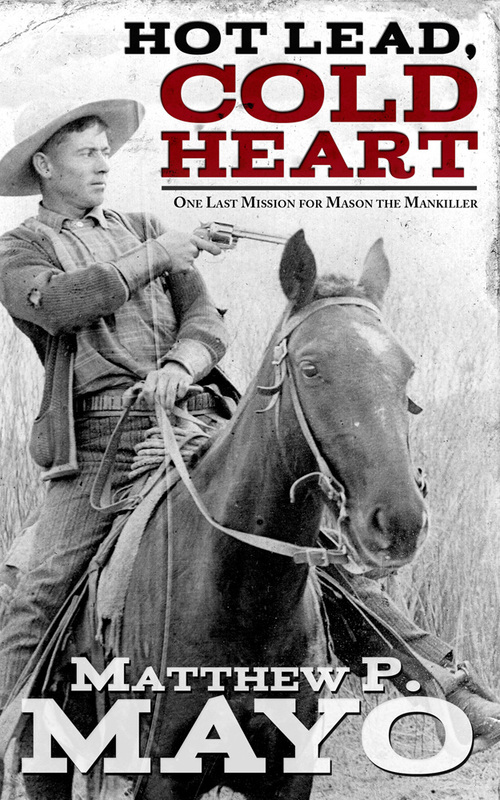 Mason the Mankiller, vigilante hero to the downtrodden, has come out of retirement to settle one last score‚ the only one that ever mattered‚ with a man who long ago forgot he’d wronged the famous ‘killer of killers.’ A tonic peddler, vengeful sisters, and a reluctant lawman all dog Mason’s trail. But he vows that nothing will stop him from seeing this last mission through to its end‚ an end he’s sure he won’t survive. … HOT LEAD, COLD HEART is as much Louis L’Amour’s HONDO as it is Barry Hannah’s NEVER DIE or Percival Everett’s GOD’S COUNTRY. The third Mayo Western I’ve read and up to the usual standard of good writing with disparate characters meeting up and their lives entwining. The mystery that is Mason is explained in the denouement. Very satisfying read, with humour, action, violence, suspense and compassion.